At the beginning of this month Mara Hoffman showcased Northern Africa inspired ready-to-wear Fall collection 2014 in New York. As designer said “It’s the most black I’ve ever sent down the runway,” but no worries, Mara, it all looked more that words could express. Using silk she present with lively, colourful and vibrant style, which seems to be the continuation of her previous work. 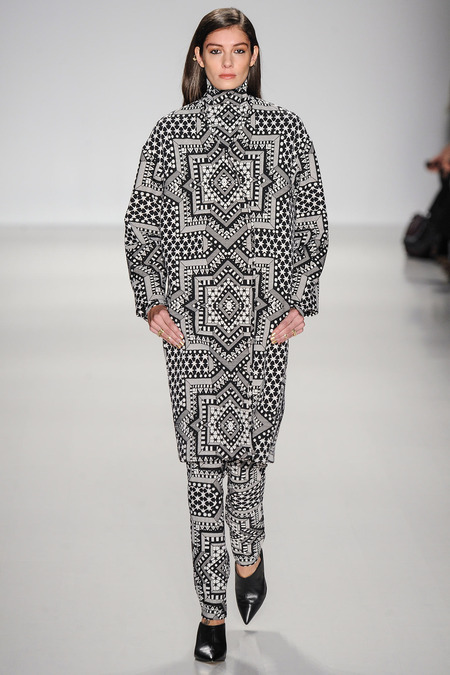 Kaleidoscopic patters as well as interesting prints of camels waves together with flowing fabrics and long dresses. Deep V-necked tops were definitely her favourites this season. From bold prints to mesmerizing patterns to black gowns – each woman can find something closer to her heart, and I guess that makes this collection so dear and loveable. Not only you can see the source of inspiration, but also experience the vitality of wilderness and sophistication. Tunic and pants would be one of the most eye-catching pieces. Every touch is there – jewellery, cut, draping, hairstyle and makeup. We can only wait for red carpets to meet these joy and elegance celebrating outfits.